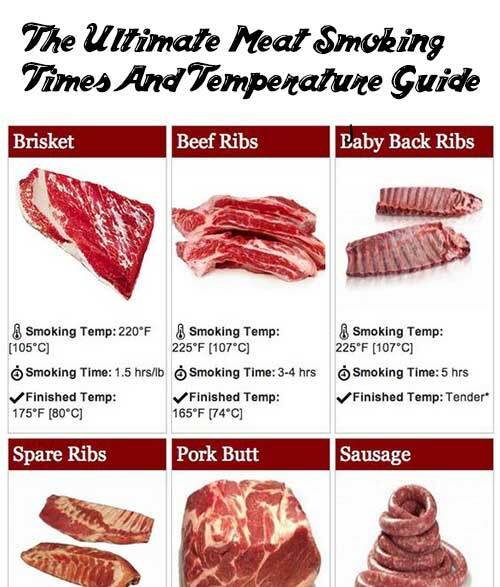 Are you looking for the ultimate meat smoking times and temperatures? Look no further because today I am sharing an infograph that you can save or print to save you the hassle of ever looking up a certain meat’s temperature again. Smoking is the process of flavoring, browning, cooking, or preserving food by exposing it to smoke from burning or smoldering material, most often wood. Meats and fish are the most common smoked foods, though cheeses, vegetables, and ingredients used to make beverages such as whisky, smoked beer, and lapsang souchong tea are also smoked. Smokehouse temperatures for cold smoking are typically done between 20 to 30 °C (68 to 86 °F). In this temperature range, foods take on a smoked flavor, but remain relatively moist. Cold smoking does not cook foods. Meats should be fully cured before cold smoking. Cold smoking can be used as a flavor enhancer for items such as chicken breasts, beef, pork chops, salmon, scallops, and steak. The item is hung first to develop a pellicle, then can be cold smoked for just long enough to give some flavor. Some cold smoked foods are baked, grilled, steamed, roasted, or sautéed before eating. Hot smoking exposes the foods to smoke and heat in a controlled environment. Like cold smoking, the item is hung first to develop a pellicle, then smoked. Although foods that have been hot smoked are often reheated or cooked, they are typically safe to eat without further cooking. Hams and ham hocks are fully cooked once they are properly smoked. Hot smoking occurs within the range of 52 to 80 °C (126 to 176 °F). Within this temperature range, foods are fully cooked, moist, and flavorful. If the smoker is allowed to get hotter than 185 °F (85 °C), the foods will shrink excessively, buckle, or even split. Smoking at high temperatures also reduces yield, as both moisture and fat are “cooked” away. Smoke roasting or “smoke baking” refers to any process that has the attributes of smoking combined with either roasting or baking. In North America, this smoking method is commonly referred to as “barbecuing”, “pit baking”, or “pit roasting”. It may be done in a smoke roaster, closed wood-fired masonry oven or barbecue pit, any smoker that can reach above 180 °F (82 °C), or in a conventional oven by placing a pan filled with hardwood chips on the floor to smolder and produce a smoke bath. Check out the ultimate meat smoking times and temperatures on the next page. Remember to save or print it off so you have it for future use!